The Coast Guard is establishing security zones Friday in the Intracoastal Waterway and offshore near Palm Beach. 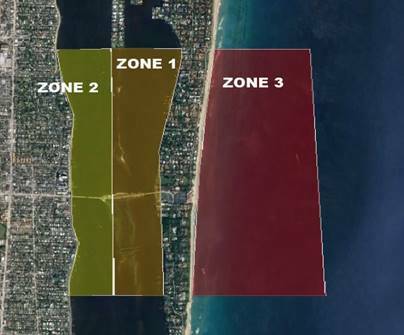 The security zones began at 6 a.m. Feb. 3, and will continue until 11:59 p.m. Feb. 6, to include certain waters of the Lake Worth Lagoon, Intracoastal Waterways and the Atlantic Ocean in the vicinity of Mar-a-Lago Club and the Southern Boulevard Bridge in Palm Beach. The security zone is necessary to protect the VIP and accompanying official party, the public, and the surrounding waterway from terrorist acts, sabotage or other subversive acts, accidents, or other causes of a similar nature. Entering, stopping, or anchoring in this security zone is prohibited unless authorized by the Captain of the Port Miami or a designated representative. The security zone will be broken into three zones. Zone (1): This zone is always in effect. No vessels or person will be permitted to enter this zone consisting of the waters of the Lake Worth Lagoon from the southern tip of the Everglades Island in the north to approximately 1,000 yards from the south of the Southern Boulevard Bridge on the south and eastern shore line west of Fisherman Island. Zone (2): This zone is always in effect. All vessels transiting the second zone shall maintain a steady speed and shall not slow or stop from waters of the Lake Worth Lagoon including the Intracoastal Waterway from the southern tip of the Everglades Island in the north to approximately 1000 yards from the south of the bridge on the south and from the western shore line to the western edge of the Fisherman Island in the east. Vessels needing to wait for the Southern Boulevard Bridge to open in zone 2 are permitted to wait in this zone only for the draw bridge to raise for safe passage. Zone (3): This zone is always in effect. All vessels transiting the third zone shall maintain a steady speed and shall not slow or stop from waters of the Atlantic Ocean from the Banyan Road in the north to Ocean View Road in the south and from shore to approximately 1000 yards east of the shoreline. Vessels seeking authorization to transit security zone 1 must contact the Coast Guard via marine-band radio via VHF-FM channel 16.